This article describes the installation process of using Azure Access Control Service (ACS) as an identity provider for SharePoint. This article uses Windows Live-ID as test. This article uses ACS as the first federator after the consuming application with reference to the below architecture. The below should give a simple overview to the infrastructure of identity federation. The approach is generic, however my experience is vastly within the Microsoft portfolio of identity federation products. The following description is from an infrastructure perspective and does not cover the solution specific elements like the claim specification e.g. 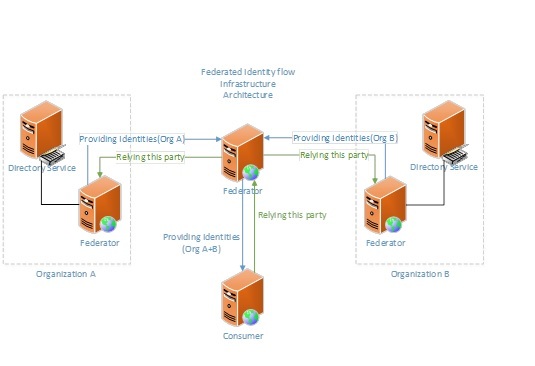 A federator(Identity Provider) can federate its own organization identities to either another federator or to a consumer. The relying party is created from either the consumer or another federator, to the federator providing the identities. A federator can federate one or more organizational identities to the same consumer. Had some issues trying to piece together all the parts of the puzzle in order to get Web Application Proxy, ADFS and Kerberos to work together with a SharePoint 2013 Web Application hosting a Business Intelligence site, the linked guide should outline the most relevant points required. The rest should be read from references. I’ve encountered quite a few people not quite sure on how certificates work. I posted a rather simplified explenation on the matter on Technet and just wanted to add it here. Certificates consists of certificate chains. Look at each link in the chain as a certificate. When ever you browse a https site(SSL), you are requesting the certificate information. For a certificate to be trusted, you need to trust the top level of the chain(Certificate Authority Root) and sometimes the Intermediate Certificate Authority. If you open a certificate and look at the Certificate Path, you will see this full chain of certificates. This means that you computer already trusts the provider of the certificate and therefore your certificate is also trusted. This also applies to any other Windows computer. The certificate name does not affect what comes after the domain. ‘jesper.contoso.com/rum’ is absolutely the same as ‘jesper.contoso.com/whisky’ in terms of certificates. A certificate can contain multiple names, called SAN(Subject Alternative Name) – But thats another story, which is not relevant right now. The .cer certificate is used against anything public facing. The .cer can be downloaded from your sites if you view the certificate available. This will not include the private key. A .pfx is obtainable from the server itself by exporting the certificate including the private key. If you cannot export with private key, the certificate either does not include the private key or the private key is not marked for export. Just a heads up warning if your planning to use PerformancePoint Designer ClickOnce application, then you should not apply Cumulative Update October 2013 to your SharePoint 2013 farm. The files has been signed by a MS person and not by MS cooperation, which will cause the installation to fail. <publisherIdentity name="CN=Microsoft Corporation, OU=MOPR, O=Microsoft Corporation, L=Redmond, S=Washington, C=US"
You can replace the files from a previous version, as long as all hash values matches. Note: Applying SP1 does not resolve the above. Got tired of implementing huge warmup scripts, so decided to put together the simplest form. This will hit all site objects within the sharepoint farm. the $ie.Visible = $true, should only be used in the development phase. It can be set to $false or completely omitted. With false or omitted, it will only spawn a process and not display the GUI of internet explorer. Edit 27-July-2016: Changed from single site to all SP sites.